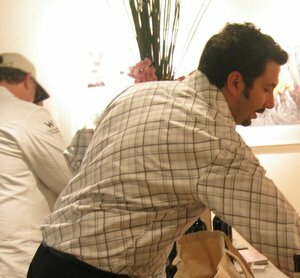 The Marx-Saunders Gallery (230 W. Superior St.) hosted Wave restaurant of the W Hotel Chicago-Lakeshore. 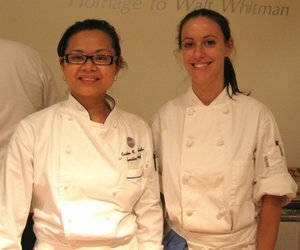 We spoke with Executive Chef Kristine Subido who was unfailingly welcoming and clearly proud of her work. 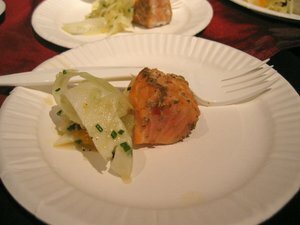 And the fennel encrusted salmon with citrus and arak glaze we were served made it clear that she deserves to be. 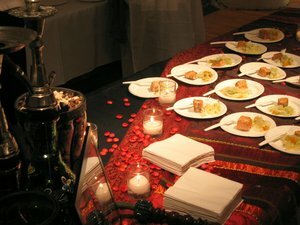 The detail in site set-up for this table was far and away the most thought out and beautiful. The Cuvaison Winery of Paterno Wines International was available for tasting. 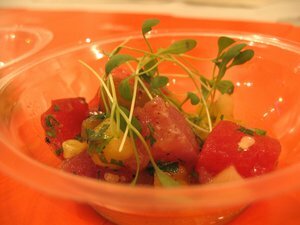 We walked to the adjacent Schneider Gallery (230 W. Superior St.) to find ristorante We of the W Hotel Chicago-City Center. 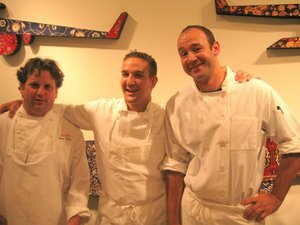 I believe Executive Chef Charlie Brown was busy preparing the items, though John and I were able to speak at length to Mark DiDomenico, who much like Chef Subido was impressively warm and charismatic. ristorante We served a chilled poached garlic soup with grilled asparagus and olive oil croutons and topped with greens. This was easily the most delicious dish we tasted that evening. 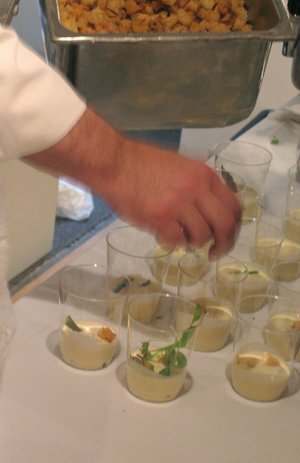 The velvety-smooth texture of the soup was punctuated with the resoundingly clear flavors of garlic and asparagus creating a near perfect sensation. DiDomenico informed us that at the restaurant the soup is served warm, however the chilled version had been a huge hit that night. I hope that John and I can make it over to ristorante We sometime during the next few weeks. 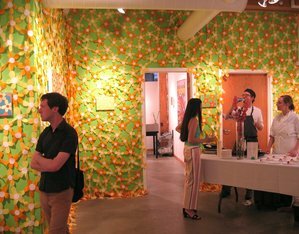 We moved on to the Judy Saslow Gallery (300 W. Superior St.) and took a pass on the Izze sparkling juices. Though quite good, we needed to save room for new things. 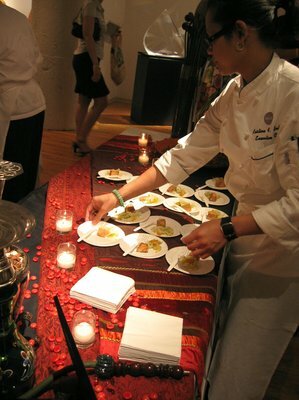 The Spice House had a table set up with, according to the pamphlet, "Ginger nibs and cacao nibs, in the form of baked nibbles." Regardless of what you might call them, we ate some amazing cookies here. The gingersnaps were so soft and the ginger so pronounced, giving them a warm and filling flavor. 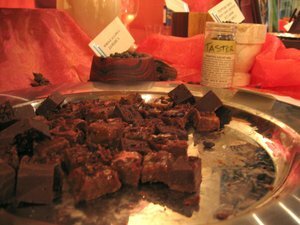 The chocolate brownies tasted of high-quality chocolate rather than cocoa powder and flour as some might, thanks to the "nibs". Quite good. 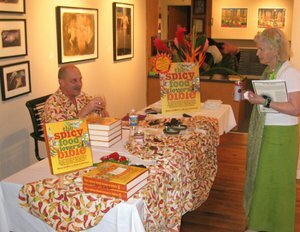 Also hosted in this gallery was Dave DeWitt, author of the Spicy Food Lover's Bible. The book was available and DeWitt was offering to sign copies. At the table he had samples of wasabi. 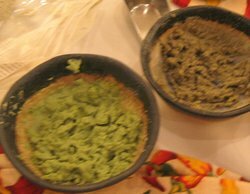 The first (on the left) was a bright green wasabi made with commercially available wasabi powder. This wasabi was one we are all likely familiar with, it has a sharp and prolonged spiciness which is readily available at any sushi establishment (and sometimes may even be horseradish with food coloring!). The next dish was made with freshly grated wasabi. It was dark green in color and had a very mellow and smooth taste. It was less spicy but at the same time tasted more complex. It was exceptional and quite eye-opening to see the difference between the two types of wasabi. We descended a staircase to the Catherine Edelman Gallery (300 W. Superior St.) to find the West Town Tavern closing up their stand. Determined to use our last half hour wisely we crossed the gallery to find the Barboursville Vineyard of Virginia. 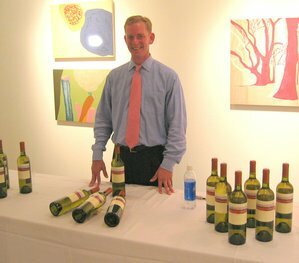 Of the Barboursville wines we were able to sample, the best was their Octagon 2002. 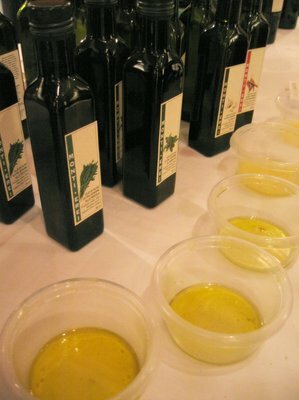 The real treat of this table was the Monti Erei extra virgin olive oils. Infused with flavors such as garlic, mint, arugula, and pepperoncino these oils provided a delectable and unique array of flavors. Behind the garlic soup at ristorante We, these olive oils were the best tastes to be had. They can be purchased at Sam's Wine here in Chicago. Walking through the lower entry way we came upon the zg gallery (300 W. Superior St.) and Lula Cafe. 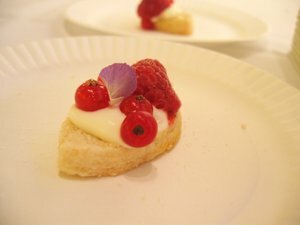 Chef Jason Hammel and Chef Amalea Tschilds served a very refreshing seasonal dessert of sweet biscuit shortcake with honey, lavender crème fraiche and local berries. The dish had a lovely presentation as well. I have had the pleasure of eating several meals at Lula Cafe and would highly recommend it to anyone. Also in this gallery we found Paringa White Blend wine. These was one of my favorite wines of the night. If memory serves this was a blend of Chardonnay, Semillon, and Sauvignon Blanc. It was crisp, light, and refreshing and would be a fantastic summer white for a hot evening. This too was an excellent summer dish boasting a festive array of colors, a very nice way to end the evening. 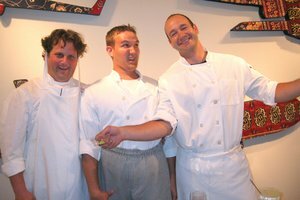 The three men were sweet and their humor provided a nice segue-way into the night as we left with full bellies and heads cushioned by wine. I would like to thank Portia Belloc Lowndes for inviting John and I, it was a lovely opportunity. Check out the book she co-authored, The Slow Food Guide to Chicago.